The author is greatly indebted to Mr. Carlos Tomaszewski for providing information critical to making this paper possible. Calculators made by Compucorp are extremely interesting and wonderful calculating machines. Compucorp machines had a real style about them, both in terms of their physical appearance, and their high-end functionality. Technologically, Compucorp's calculators (and those sold by OEM customers including Monroe(US), Smith-Corona/Marchant [SCM] (US), Deitzgen(US), Sumlock(UK), IME(Italy), Seiko(Japan) and Ricoh(Japan)). were highly advanced, pushing the state of the art in large-scale integrated circuit technology, as well as utilizing a very computer-like architecture. Compucorp's unique architecture used a multi-chip general purpose CPU (the precursor to a microprocessor) with specialized ROM-based software making up the personality of each different model of calculator. 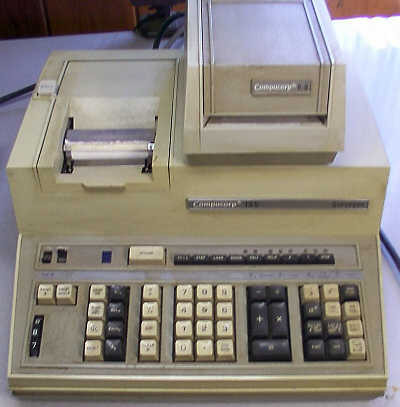 The flexibility of the architecture allowed Compucorp to manufacture a wide range of calculators for many different types of applications, including scientific, statistical, financial, and even for surveying work. Compucorp's later calculators blurred the line between calculator and computer, offering highly-expandable calculator processors that could be connected to a diverse range of peripheral devices to form what, for all intents and purposes, was a small computer system. Compucorp got its start the way that many high-tech companies get started -- as a spin-off. Compucorp actually had its genesis in another company, Wyle Laboratories, of El Segundo, California. In 1961, Wyle Laboratories acquired a small company specializing in digital logic modules and custom electronic systems. This company had two consultants named Thomas Scuitto (an electronics designer, who designed the calculator) and Matthew Alexander (who was the business side of the team), that were working for them developing an electronic calculator. Since the consultants were part of the team now, the calculator effort simply migrated to Wyle Labs. A substantial amount of development had already been done on the calculator project, enough that it was decided by Wyle management to go ahead finish its development and bring it to market. Frank Wyle, the President of Wyle Labs approved funding for completion of the calculator to the tune of almost $1 million, which, in 1962, was a great deal of money. Jack Rosenburg was brought in as the Chief Engineer at Wyle, and was put in charge of the engineering aspects of the acquired company, including the calculator project. During Rosenburg's reign, he had brought in an engineer named Carlos Tomaszewski. Prior to working for Rosenburg, Tomaszewski was working at Wyle as the Chief Engineer of Wyle's Products Division, developing data acquisition and telecommunications products. Tomaszewski's role under Rosenburg was to spearhead the engineering work needed for completion of the calculator project. During the course of the project, disagreements between Rosenberg and Frank Wyle left Rosenburg frustrated, and he left the company. With Rosenburg's departure, Tomaszewski assumed Rosenburg's role as Chief Engineer. With a great deal of hard work from everyone involved, the calculator project was completed. The calculator became the Wyle Laboratories WS-01 Scientific. The WS-01 was quite an amazing machine for its time, utilizing a rotating magnetic disk (remotely related to the hard-disk drives found in a PC today) with six dedicated tracks (with each track having its own read/write head) for storage of the working registers of the machine. A dedicated seventh track contained a pre-recorded timing track that served as the master clock for the logic of the calculator. The logic of the WS-01 was formed using discrete transistors and diodes. The machine used a CRT display that provided on-screen display of the six calculator registers, each with a capacity of 24 digits. Unforuntately, there were reliability problems with the magnetic disk storage device, and a redesign was done to replace the unreliable disk with a form of solid state storage. By late 1964, the "Wyle Scientific" Model WS-02 was introduced. The primary design change between the WS-01 and the WS-02 was replacement of the magnetic disk memory with a magnetostrictive delay line for the working register storage. The WS-02 was virtually identical physically to the WS-01, and had exactly the same feature set. Electronically, the main difference was changes to the logic to accomodate the delay line memory versus the disk memory system, as well as to generate a master clock for the calculator. For both the WS-01 and the WS-02 Scientific calculators, the display showed the content of the three memory registers, along with the entry register, the accumulator, and a multiplier/quotient register. The machines provided the standard four arithmetic functions, plus single-entry squaring and square root. Both machines were designed to allow add-on peripheral devices such as printers, external displays, a punched card reader, and paper-tape reader/punch equipment. When equipped with the optional external punched card reader, the machines were programmable via standard IBM-style pre-scored punched cards that could be taped together to form loops which allowed repetitive operations to be performed automatically. The card reader could read both forward and backward, allowing true branching and looping operations to be performed. At the time that WS-02 was introduced, there weren't very many players in the electronic calculator biz. Sumlock/Anita in England had their Anita C/VIII, Friden with their EC-130, Mathatronics with the Mathatron calculator, and Wang, with their LOCI-2 machine in the US; and Casio and Sharp in Japan with their early transistorized calculators. Only Wang's LOCI-2 and the Mathatron were programmable in any way. Wang's LOCI-2 was big, expensive, and somewhat difficult to operate, even though it was technically more capable than the Wyle machine. The Mathatron was a technological tour-de-force, leapfrogging the state of the art, but the company that made it was a relative newcomer to the market, without a lot of exposure at the time. 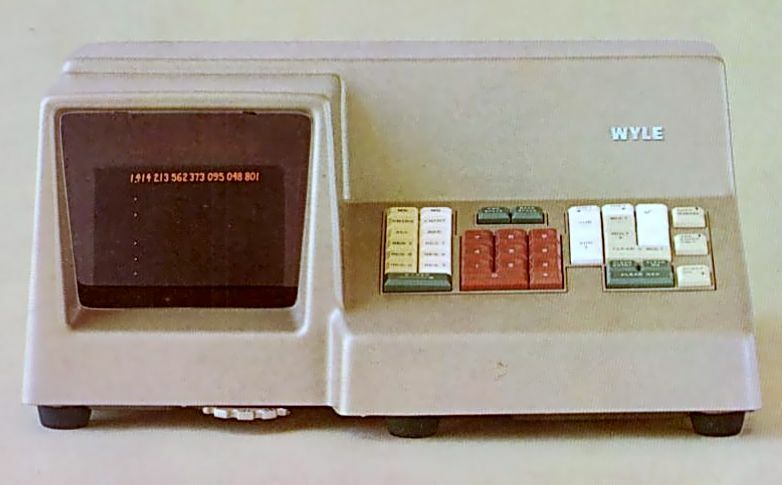 The WS-02 was marketed and sold until sometime in late '67 to early-'68, by which time the electronic calculator business had changed radically, making it more and more difficult to sell the machine amidst the competition. A project to develop a new calculator was started, but never really made it off the ground, as Frank Wyle was reluctant to invest more in the calculator business. The inability to convince management that a new calculator project was needed to replace the dataed WS-01/WS-02 machines didn't mark the end of electronic calculators at Wyle Labs, though. Sometime in late 1965, Wyle Labs was contacted by Nippon Calculating Machine Co. (NCM), of Tokyo Japan. 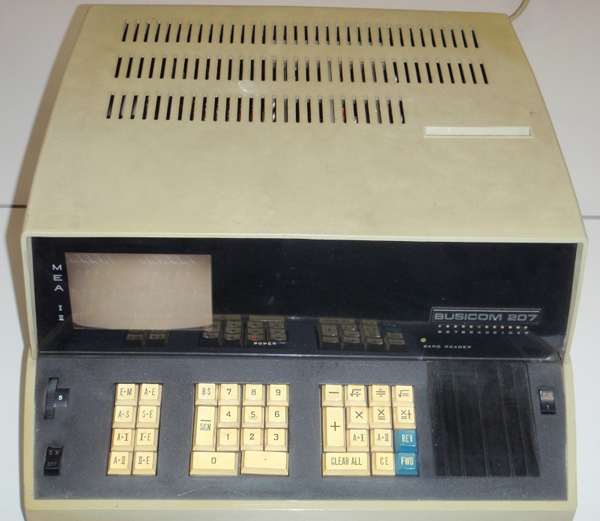 NCM had been very successful in the Japanese mechanical calculating machine market, and in July of '66, entered the electronic calculator marketplace with the introduction of its own desktop electronic calculator, the NCM Busicom 161. This calculator utilized transistorized circuitry and a small (256 bit) magnetic core memory for working register storage. Intrestingly, the Busicom 161 shares a great deal of basic design methodology with the early calculators made by Industria Macchine Elettroniche (IME) of Italy. There were accusations by IME that the Busicom 161 was a cheaped-down copy of its elegant and extremely well-built IME 24, but nothing ever really came of it. Whether or not this was the case, the story appears to be lost in time. The reality was that the Busicom 161 was significantly less-expensive than other electronic calculators of the time, and was very successful. However, NCM knew that it couldn't rest on its laurels, as the electronic calculator market was expanding rapidly. There was a realization that the market lifetime the 161, and a lower-cost introduction with less capacity, the 141, was somewhat limited. NCM's management wanted a more advanced electronic calculator, and relized that it may not have all the expertise it needed to develop a more advanced machine. A search was begun by NCM to seek someone that could design and develop an advanced calculator for them. Wyle Laboratories had embarked on making more of a market for itself by selling OEM products based on the Wyle WS-01 and WS-02 calculators. The design of these machines was quite modular, and so Wyle offered components of the calculators to OEM customers. For example, the "calculating engine" of the WS-02 was offered as a standalone unit called the AP-01. 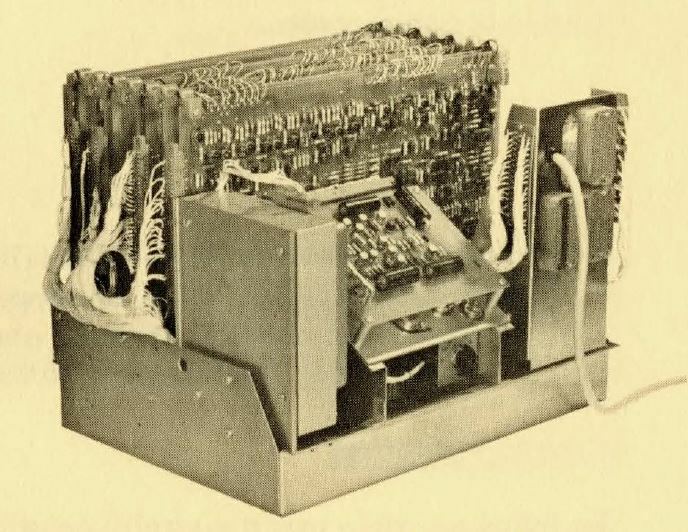 This system could accept commands as if entered from a keyboard, and also had a coded output representation that could be used to get results of calculations. All an OEM customer had to do was add power, and interfaces to external equipment, and they had the computing capability that could be applied to any number of different applications including process control, data acquisition, and many others. It was this aspect of Wyle Labs business that attracted the attention of NCM. The prospect of doing calculator development for other companies was something that Frank Wyle and the management team at Wyle Labs could get behind. Such development work would keep the Wyle Labs calculator engineers employed and busy, yet didn't involve all of the overhead of maintaining a calculator sales, support, and service business. There were thoughts that perhaps this role could be extended to other calculator companies, potentially bringing in some well-needed cash, while reducing overhead. Busicom representatives met with Wyle Labs, and soon an agreement was forged by which Wyle Labs would develop a next-generation calculator for Busicom, which Busicom would manufacture, market, and support as its own advanced calculator. There was great relief among Wyle Labs products division employees when this deal was announced, and though there were some reductions in staff, this development did allow many of the core engineering team to remain employed. Work on the project began immediately. Wyle's engineers dusted off some of the concepts from the canceled follow-on to the WS-02, along with making use of new integrated circuit technology to create the design of the for NCM. The calculator design utilized a magnetostrictive delay line similar to that used in the WS-02. The use of new DTL (Diode-Transistor Logic) small-scale integrated circuits meant that the calculator was smaller and faster, as well as more-reliable than the earlier transistorized machines. This calculator design was licensed to NCM/Busicom for manufacture and sale by exclusively by NCM. The calculator was a five-function machine, with square root and two memory registers, utilizing a CRT display with vector-generated segmented digits (versus the beautiful sine/cosine generated digits of the WS-01/WS-02 calculators). The machine was introduced by NCM in November of 1967 as the Busicom 202, and sold solely through NCM's network of distributors. While the Busicom calculator project kept Wyle Labs involved in calculator technology, during the development of the project for NCM, Wyle management kept steady pressure to move away from the calculator and in-house developed data processing equipment business, deciding instead to focus its Products Division on computer-based data collection and instrumentation systems, utilizing various commercially-marketed mini-computers versus its internally-developed data processing devices. Even though the numbers brought in by the calculator part of the Products Division were better, they still were not good enough, and it soon became clear that the days of calculator development work at Wyle Labs were running out. The 202 was a good start on the advanced calculator that NCM wanted. 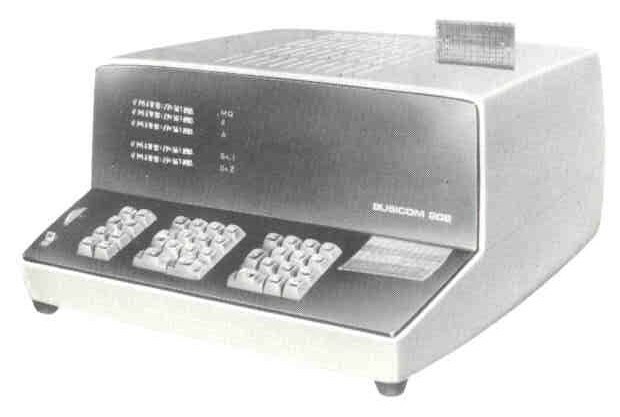 However, Busicom wanted to advance its line of calculators with ever-more sophisticated machines. Wyle Labs was signed up in mid-'67 to develop machines with additional capabilities. The resulting machines were outgrowths of the technology used in the 202, and became the Busicom 207 and 2017 calculators. These machines provided additional memory registers for use in more complex calculations. 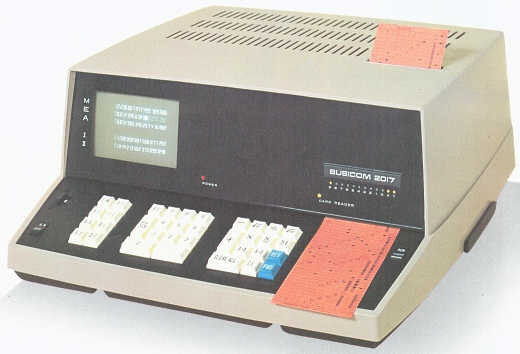 The Busicom 207 came with with seven memory registers, and the Busicom 2017 with seventeen memory registers, both introduced in February of 1969. The 207 and 2017 calculators used a CRT display similar to that of the 202, and were similarly programmable via a built-in punched card reader. As the calculator development projects for NCM wound down in mid-1968, Wyle Labs management decided to abandon any further business involvement in the calculator field. At the time, the last of the NCM project was transitioning out of Wyle to NCM, and it seemed a good time to make a clean break from the calculator business. NCM/Busicom was notified that there would be no more calculator development work done for them, or anyone else, and the agreement between the two companies was nullified. As it turned out, it wasn't such a big deal for Busicom, because it was already working on forging a relationship with a fledgeling Large Scale Integration IC manufacturer in the US. This final decision by Wyle management to get out of the calculator business completely was of deep concern to a group of employees involved in Wyle's calculator business, who felt that the calculator market still held the potential for a successful business. By mid-'68, this group of folks decided they wished to venture out on their own to form a company that could focus on the electronic calculator marketplace. Among these people were Mr. Elmer Easton, who was the prime instigator of the move to form a new company, as well having some financial resources that could potentially get the new business rolling. Easton and a core group of business-minded folks from Wyle Labs decided to put together a proposal for Wyle Labs management to spin off a new independent company to design advanced electronic calculators using the latest technology. The proposal was drafted and presented to Wyle Labs management sometime in the late summer of 1968. Frank Wyle, the owner and President of Wyle Laboratories, blessed the proposal, and Wyle Labs became a major initial investor in the new company. Mr. Easton was named the President of the company. On the engineering side, Carlos Tomaszewski also joined the effort, along with a group of other talented businessmen, engineers, technicians and support staff. The group of folks that left Wyle Labs formed "Computer Design Corporation", (hereafter referred to as "CDC", with apologies to the former Control Data Corporation), which was incorporated in September of 1968. Straight away, CDC did some top-secret computing-related development work for the US government with early MOS(Metal Oxide Semiconductor) small and medium-scale integrated circuits. The government was very interested in integrated circuit technology for a wide range of military and intelligence applications, and CDC was provided some funding by the government to develop electronic computing technology related to cryptography. This work proceeded at a rapid pace, since many of the concepts had already been developed as part of the calculator work that was done at Wyle Labs. While there was great technical expertise at CDC, the company did not have a sales organization. However, it really didn't need sales and marketing, as the plan was to market the calculators the company would manufacture to companies that already had established marketing, sales, and service organizations. Given that there was already quite a bit of competition in the electronic calculator market, the founders decided that rather than selling calculators directly, they would sell their leading-edge technology calculators to other calculator companies, especially those that might be mired in the difficult transition from the mechanical to the electronic age of calculating. The development work done for the government fit into this model very well. The design developed for the government work ended up being a microcoded general purpose calculating engine, utilizing 64-bit floating point math, and recirculating shift registers for data storage. The microcoded nature of the calculating engine made it possible for it to perform a very wide range of calculating tasks. 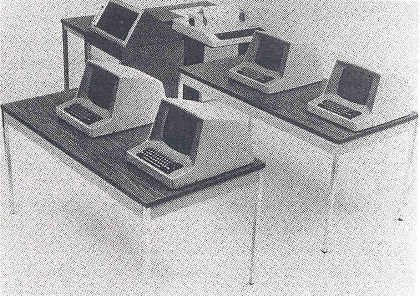 The next step, since the technology was already there, was to find customers who would be interested in selling and servicing the machines as OEM customers of Computer Design Corp. A prototype calculator was quickly put together utilizing small and medium-scale MOS integrated circuits, based on the designs developed for the government. This prototype was carried around in a large trunk to various potential customers to demonstrate the capabilities of CDC's technology. A road trip was made beginning in the early winter of 1968, with stops at many different calculator manufacturers, with the intent being to convince them of the market viability of Compucorp's advanced calculator architecture. Almost immediately, two potential customers expressed a great deal of interest: Deitzgen, an old slide-rule and drafting equipment company based in Chicago, IL, and, interestingly, former Wyle Labs customer, Nippon Calculating Machine Co, in Japan. 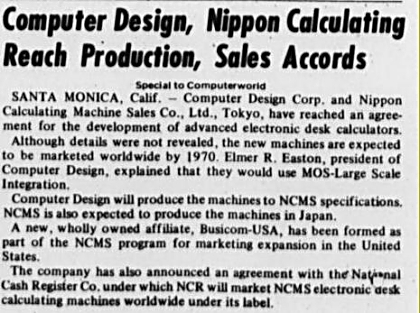 In October of 1968, an agreement was forged between Computer Design Corp. and NCM stating the CDC would develop advanced electronic calculators for NCM. However, the relationship with NCM was terminated by Compucorp shortly after it started, simply because NCM did not have a marketing presence in the United States. Computer Design Corp. management felt that it was extremely important that the largest possible markets be addressed by their technology. The U.S. was the market hotbed for calculator technology. As a result of the aborted relationship with Compucorp, NCM continued searching for other vendors to develop a similar calculating engine chipset. This led NCM to contact a California-based newcomer to the manufacturing of integrated circuit technolgy, an up-and-coming company called Integrated Electronics (later renamed Intel). The outcome of NCM's relationship with Intel eventually resulted in Intel's development of the 4004 single-chip microprocessor, a landmark in the history of the microprocessor that effectively created the microprocessor revolution. Another potential customer was shown CDC's calculator architecture in early 1969. This customer was Monroe Calculating Machine Co. Monroe was a very successful calculating machine company, but that success was based on mechanical and electro-mechanical adding machines, calculators, and accounting equipment. By late '69, it was clear that electronics were quickly taking over for mechanical devices, and as a result, Monroe needed to quickly come up with a way to update their technology. 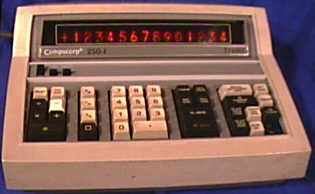 Monroe's ownership by Litton Industries, a major aerospace contractor, resulted in the design of a couple of interesting early programmable electronic calculators called the EPIC 2000 and EPIC 3000, but these machines were large (requiring a suitcase-sized electronics package, connected to a sizable desktop electro-mechanical keyboard/printer unit), expensive, and utilized all transistor technology, which was quickly being displaced by integrated circuits. Monroe was very interested in forming a relationship with a company that was concentrating on utilizing the very latest in electronics technology to reduce the size and cost as well as increase the performance, of high-end desktop calculating machines. Computer Design Corp. formed an OEM agreement with Monroe -- a major coup in the industry for CDC. While the customer relationship building was going on, work was rapidly progressing at CDC toward taking the technology of the prototype machine and integrating it at a higher level, utilizing the latest "Large Scale" integration methods to compress the calculating engine design down to a much smaller number of integrated circuit devices. As is usual, there were some design changes between the original prototype and what was to go into production. The prototype machine was developed from original logic diagrams made by the digital designers, and the "bugs" were worked out of the design as the prototype was built and troubleshooting was performed. Such a methodology isn't practical when large scale integrated circuits are concerned. Once a batch of ICs is made, there's no way to change the logic in the chips without making a whole new batch of chips -- a very expensive proposition. The solution was to develop a computer-based simulation of the chips, such that their function could be tested, and logic problems discovered before the chips were actually fabricated. The simulator was written in FORTRAN on a Control Data 6400 computer located at a Contral Data Computing Center located nearby Computer Design Corporation's headquarters. The simulator could be used for two purposes, one to test the logic, and the other, to test the microcode that had to be developed as the "program" for chipset. The simulator made it possible to assure that the logic to be committed to the chips had the best chance of resulting in bug-free chips with as few re-runs as possible. Once the logic design was completed and tested, the next step was to translate the logic into chip designs for a set of chips that would implement the logic. This process was beyond the means of Computer Design Corporation. The chipset implementation was contracted to AMI (American Micro-systems Inc.), of Cupertino, California. 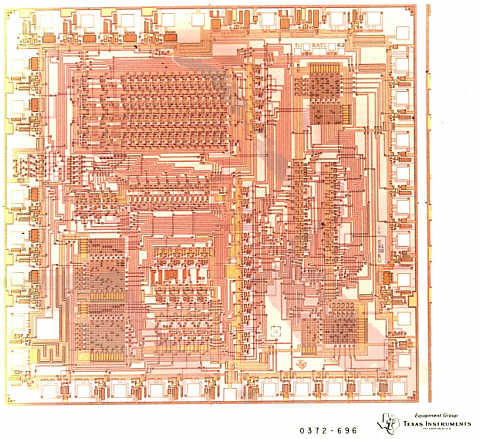 This first chipset design (called the "HTL" chipset) was completed late in 1969. The chipset consisted of nineteen different chips (part numbered HTL00 through HTL18) that could be combined in differing ways to provide the functionality needed for a wide range of calculating applications. 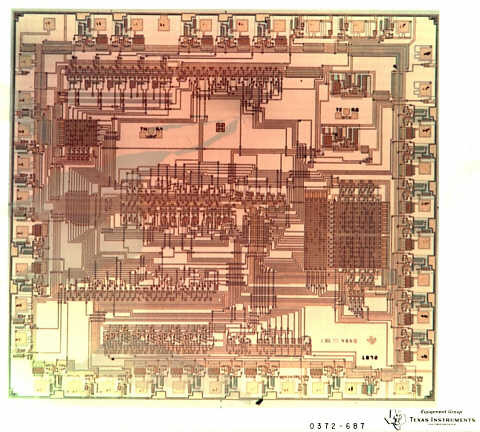 The HTL chipset was an example of early large scale integration, but in reality, the integration levels were not all that high compared to what we are used to today, with only 300 or so gates per chip. These limitations were dictated by the integrated circuit process yields at the time, reflecting the true "state of the art" in the late 1960's for production large-scale integrated circuits. The chips were made using PMOS technology, using dynamic logic with a two-phase clocking scheme. Initially, AMI was the sole-source for the chips. AMI also fabricated chips for military applications, and as part of the military's requirements, a second-source for the military chips was required. Because of this, a separate IC fabrication company was spun out of AMI called Garrett Microsystems. Some chips in these calculators were manufactured by Garrett. Sometime in late 1971, General Instruments (an early leader in MOS integrated circuits) became another source for some of the HTL chips (most specifically, the shift-register memory chips). During the time the chipset was being developed, CDC's engineers were also working at a feverish pace to develop the necessary firmware that would run on the calculating engine to allow it to perform a wide range of calculating applications. The firmware engineers developed and tested the calculator firmware using the simulation. This way, the development of the firmware could proceed in advance of the actual chipset being available. Also, the operational aspects of the firmware could be tried and true before being committed to integrated circuit ROMs. Once the production of the HTL chipset had gotten under way, two scientific calculator implementations based on the chipset had been developed. One calculator utilized Burroughs-made Nixie tubes for the display, and the other a built-in drum impact printer made by Seiko. Both calculator designs were user-programmable, through either keyboard-based learn-mode programming, or via pre-scored (IBM-style) punched cards. Production prototypes of the two machines were shown to Monroe management in December 1969, and were warmly received. The deal with Monroe was a go. Full-scale production of a number of different models of calculators tailored to specific disciplines (Statistics, Business, Scientific) began immediately. All calculator design was done by CDC. CDC built the machines, with some aspects of the manufacturing farmed out to contractors, such as circuit board manufacturing and various other components (mechanical, cabinet manufacturing). Finished circuit board testing was also farmed out to contractors that used automated circuit board testing equipment to verify the proper functioning of the circuit boards. Final assembly of the calculators was performed by CDC at a separate leased building located in Santa Monica, Ca., at the intersection of West Olympic Blvd. and Centinela Ave. Completed units were burned in for 24 to 48 hours in a high-temperature environment before shipment to final distributors. The electronic design of each of the first generation CDC-designed calculators was common between all of the models, with the only difference between the scientific, business, and statistical calculators was the microcode in the masked ROM that made up the 'program' that operated the calculator, and the layout of the keyboard to provide specific functions depending on the specialty of the calculator microcode. Printing calculators used special interface chips (part of the HTL chipset) to provide the printing functionality. The drum and hammer type impact printers were supplied by Seiko Instruments in Japan, under an OEM agreement. Initial versions of the printers were noisier than desired, requiring some minor design changes to be implemented that used softer materials for the print drum drive gears. The success of the marketing of the calculators by Monroe and Deitzgen had CDC doing very well, providing funding to grow the company in rather dramatic fashion. By mid-1970, it had a quite number of customers that were successfully selling the company's advanced calculators, including Monroe, SCM, Deitzgen, and Seiko, and Sumlock. Monroe marketed a large line of the Compucorp-made calculators, including both Nixie-display and printing models. These machines were marketed as the 1600 and 1700-series calculators. Included in the series were the 1610 Scientific, 1650 Scientific, 1651 Scientific, 1652 Scientific, 1655 Programmable Scientific, 1656 Programmable Scientific, 1660 Printing Scientific, 1665 Printing Programmable Scientific, 1666 Printing Programmable Scientific, 1710 Scientific, 1765 Surveyor, 1766 Surveyor, 1770 Scientific, 1775 Programmable Scientific, and the 1785 Printing Programmable Scientific. The success of Computer Design Corp. attracted the attention of the parent company of Monroe, Litton Industries. Merger discussions began, but the two parties could not agree on terms of a merger. The discussions ended with no deal. At this point, Computer Design Corp. management decided that it had sufficient resources to market its calculators under their own brand. In mid-1971, a division called Compucorp was created, and CDC began marketing and selling their own calculators under the Compucorp brand name. 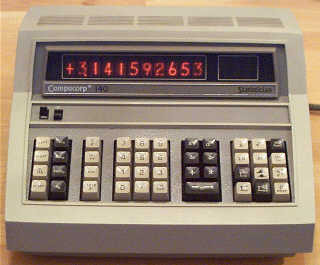 The first series of calculators sold under the Compucorp name was called the 100-series. The line included a wide range of machines, all based on the same basic design using the HTL chipset, with the major functionality of each machine defined by the microcode burned into ROM. The 100-series machines focused on Scientific (with the Model 110, 110G, 110/X, 120, 121, 122, 122E, 125 and 125E Scientist calculators), Statistical (with Model 100, 130, 131, 132, 135, 140, 141, 142, 145 and 145E Statistician calculators), and Surveying (Model 155) applications. 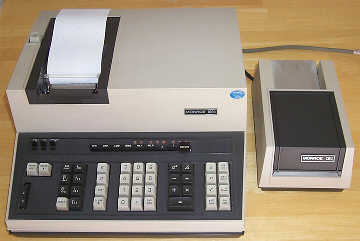 There were two basic types of 100-series machines, a display-only calculator using Nixie-tube numeric display, and a printing-only model that used the Seiko drum-type impact printer to record calculations. Introduced a while after the 100-series calculators, the 200-series came to be. The 200-series calculators still used the HTL chipset, but new microprogramming allowed the machines to address markets that weren't addressed by the 100-series calculators. The 200-series calculators focused mainly on getting Compucorp calculators into the financial applications realm. The 200-series machines retained the desktop, AC-powered form-factor of the 100-series machines, and continued to use either Nixie tube numeric displays, or drum-type impact printers. A wide range of models made up the series, including the 250 and 250-1 Bond Trader (used in financial market trading applications) machines; the 260, 261, and 263 Accountant calculators; the model 271 and 275 Banker calculators; the model 280, 281, and 285 Financier (with loan/mortgage type functions); and the model 291, and 295 Treasurer machines. Most all of the programmable 200-Series machines were offered with extended memory, which doubled the amount of program/memory storage space available. This upgrade involved simply plugging in an additional memory board. The models which came from the factory with this extended memory added an "E" at the end of the model number. 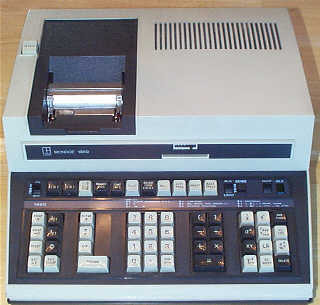 For example, a Model 275 Banker with extended memory would be designated a Model 275E Banker. During 1972, while Compucorp's salespeople were out selling the 100 & 200-series machines, engineering was working on the next generation of Compucorp calculators. A new chipset was designed, taking advantage of rapidly-increasing levels of integration to reduce the number of chips needed to implement a calculator as well as add aditional capabilities. 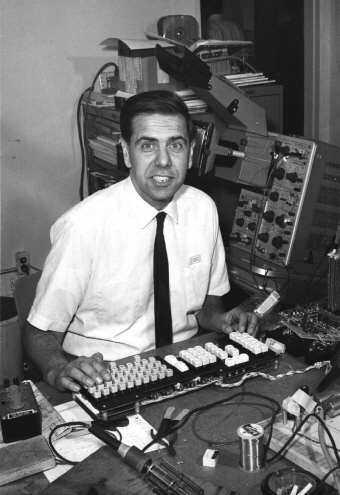 Tom Scuitto, who had left Wyle in 1966 to sail around the world with his family, provided consulting to Compucorp to help with the development of the new chipset. This chipset was called the "ACL" chipset. The ACL chipset was used in the 2nd generation of Compucorp and OEM partners' calculators. The ACL chipset was initially fabricated by AMI, but later, Texas Instruments was added as a second source to AMI, both for additional production capacity, as well as to safeguard Compucorp from any problem with AMI being a single source for their bread and butter, as well as creating some competition to help keep the IC costs under control. The chips made by TI had "TCL" part numbers. One interesting thing to note is that the Texas Instruments-made chips (TCL part numbers) have different pinouts than the AMI-made "ACL" chips, though logically they are identical to the AMI chips. The pinout of the chip was determined by the chip design, and the AMI and TI designs were different enough that the pinouts varied between the two manufacturers. Compucorp's circuit boards were designed so that either maker's chip could be used, with slightly different mounting locations for the TI- and AMI-made chips. There were two lines of 2nd generation Compucorp calculators using the ACL/TCL chipset. The 300-series brought Compucorp calculators into the "handheld" realm. These machines would fit in a hand, but were a pretty serious handful. The term "portable" more aptly describes the form of the machines. The 300-series machines provided similar functionality to the desktop 100-series machines, but in two different form factors. One was the conventional desktop format, but with a newer, more modern-looking design, and keyboard keys that were of a completely different design than the earlier calculators. The other form factor packed the functions into a much smaller, easily portable, battery-operated package. The advances in integrated circuit technology that were incorporated into the ACL chipset allowed a practical advanced battery-powered calculator to be made. Both form factors abandoned the expensive and somewhat fragile Nixie tube displays of the earlier models, replacing them with Burroughs Panaplex II planar gas-discharge seven-segment displays. 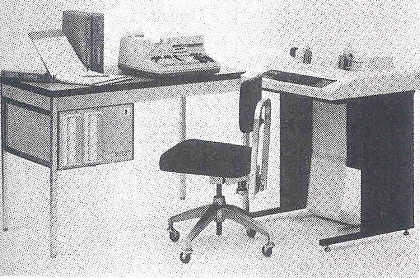 The desktop machines, as opposed to the earlier models, had both a display, and the Seiko line printer. The portable machines included a battery compartment into which either disposable D-cell batteries, or rechargeable Nickel-Cadmium cells could be installed. An external power-pack provided ability to operate on AC power, as well as serving as a charger if NiCad batteries were installed in the machine. These portable machines were hugely popular, especially with people who had to perform complex calculations "in the field", such as surveyors. AP News Report on the new Compucorp Beta 326 "Computer"
The 300-series calculators were marketed both by Compucorp, as well as through Monroe, and Smith Corona/Marchant. The portable machines in the series included the Model 320, 320G, 322, 322G, 324G, 326, and 326G Scientist calculators; the Model 340, 342, and 344 Statistician machines; the Model 360 and 360/65 Bond Trader/Financial calculators; and the Model 354 Surveyor. The desktop machines included the 325 Scientist and the 327 Scientist. There are likely other models of the desktop machines that provided Statistical, Financial and possibly Surveying functions, but their existence is not entirely clear at this writing. Some of the programmable 300-series machines provided the ability to connect a specialized cassette recorder in order to provide off-line storage for programs and data. This proved to be a real advantage when volatile RAM was used to store programs. Along with cassette tape program and data storage, there were numerous other interfaces for the 300-series calculators. Peripheral options included the Model 300 I/O Writer, the Model 310 Data Coupler Interface, and the Model 395 Teleprinter-Serial I/O Interface. The 400-series of Compucorp calculators also used the ACL chipset, but had more ROM and RAM capacity than the 300-series machines, but were limited to desktop form-factor only. These machines were very highly capable devices, with greater I/O interfacing capabilitis and significantly more program step and memory register storage. 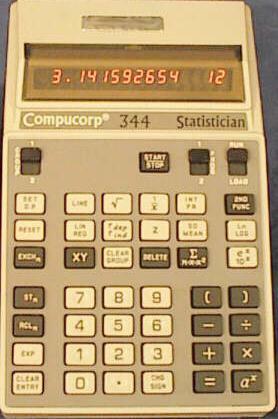 These calculators included the Model 425 (Scientific), 445 (Statistical), and 485 (Financial) machines. Compucorp marketed the 400-series machines as computing systems, including a calculator "CPU" connected to peripherals such as floppy disc drives, line printers, and even CRT terminals. The 400-Series calculators were also marketed by Monroe as the 1800-Series, which included the Model 1810, 1830, 1860, and 1880 desktop calculators. The computer-like features of the 400-series calculators provided very flexible peripheral interfacing, allowing for wide range of peripheral devices to be connected to the calculator. All of the 400-series calculators came with a built-in 21-column, three line-per-second drum impact printer, and a magnetic card reader/writer. 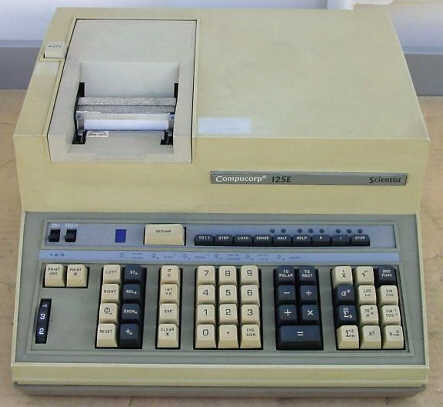 The Compucorp 485 (also sold by Monroe as the Model 1830) was a general-purpose desktop calculator, with full programmability and I/O interfacing capabilities. The Model 425 Scientific calculator (also sold by Monroe as the 1860) provided advanced scientific calculating capabilities, including built-in trigonometric functions. Lastly, the Model 445 (sold by Monroe as the Model 1880), was designed for advanced statistical applications. All of the Compucorp 400-series calculators could be combined with peripherals and specialized software to form a fully-featured computing system. The peripherals from the 300-series calculators would interface with the 400-series calculators, along with a line of 400-series specific peripherals that could push the calculator firmly into small computer system territory. These peripheral options included: Mark-Sense Card Reader (Model 490); Dual 8" floppy disc data storage systems (Model 491-2); Cassette Tape Unit (Model 492); X-Y Plotter (Model 493); IBM Selectric I/O Typewriter Interface (Model 495); and a 1/2-inch Magnetic Tape Drive (Model 497). Outfitted with the right selection of peripherals, a 400-series calculator could serve as the core of a capable business computing system. During the course of 1972, the calculator market began to change quite dramatically. Single-chip calculator implementations were becoming commonplace from makers like Texas Instruments and Mostek. The prices for basic four-function calculators dropped dramatically over a very short period of time. Battery-powered, LED-display, handheld "four-banger" calculators became mainstream. The dramatic changes in the marketplace began to put pressure on makers of higher-end machines to reduce their prices. Then, like a bolt out of the blue, Hewlett Packard introduced its ground breaking HP-35, a rechargeable battery-powered, "shirt pocketable", handheld scientific calculator. The introduction of the HP-35 marked the beginning of a calculator market shake-out, with many of the eager start-up calculator manufacturers falling by the wayside. Even some of the larger players in the calculator business started to suffer. Wang Laboratories, one of the major players in the early days of electronic calculator technology, dropped out of the calculator market by the mid 1970's as a result of the shake-out. The shake-out hit Compucorp (and it's partners) pretty hard. It became more and more difficult for the salespeople to sell a large, power-hungry desktop or "luggable" calculator that had a selling price in the $600 to $1200 range when anyone (who could stand to wait for delivery due to the rampant demand) could go out and buy an HP-35, which was much smaller, lighter, and nearly as capable (though lacking programmability), for a mere $395. Soon afterward, Texas Instruments introduced its own handheld scientific calculator, undercutting HP's price. In an attempt to leverage its calculator business, yet move more toward the new market of small business computing, Compucorp marketed three bundled systems based on the 400-series calculator architecture. These bundles were called the Model 402 Business Computer System, the Model 403 Data Collection System, and the Model 450 Computing Calculator System. The 402 Business Computer System packaged a Model 485 calculator with the 491-2 dual floppy disc drive system, and a Digital Equipment (DEC) LA-36 120-column, 30cps dot-matrix printer, along with a software operating system called DOS-K that provided powerful file-oriented data handling capabilities for the very computer-like system. The Model 403 Data Collection System was marketed as a multi-user data entry system to capture data entered by date entry clerks to magnetic tape for processing on mainframe computer systems. The 403 utilized a 400-series calculator as the CPU and provided connections for up to four CRT-display data entry terminals. The system came with the Model 497 1/2" magtape drive, to which data entered on the terminals would be written for transfer to the larger computer. Also included was the Model 491-2 dual floppy disc drive system. The data entry forms definitions were stored on floppy discs to make it easy to change forms for differing data entry operations. Lastly, the 450 Computing Calculator System was a multi-purpose system that could be configured for Business, Scientific, or Statistical applications. The 450 utilized a special CPU unit, based on the 400-series calculator architecture, but packaged as a monolithic unit that had no keyboard, printer, or magnetic card drive, and utilized much different firmware than the calculators. This monolithic CPU was called the 3000-series microprocessor. The CPU provided more RAM and ROM memory capability than the calculators could provide, allowing for more complex programs to run on the system. The systems came standard with 8K-bytes of user RAM, dual floppy disc drives, dual telecommunications controllers, keyboard console, magnetic card reader, and what was called a "System Printer", identical to the printer used the 400-series calculators. All of this was packaged into a desk-like form-factor. Along with the hardware, the DOS-K or DDD disk operating systems were available, along with an assembly-language processor called AL400 that could be used by programmers to develop complex applications for the system. 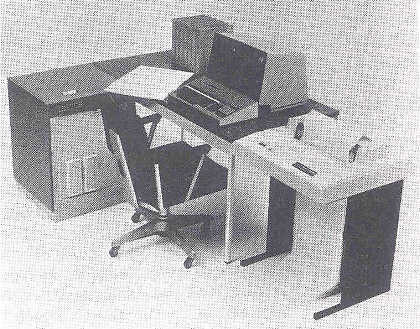 Options for the system included a CRT-display unit, and a DEC LA-36 printer. Even with the change of focus toward providing computing solutions, Compucorp's direct sales business strategy never really generated enough revenue to sustain the company. 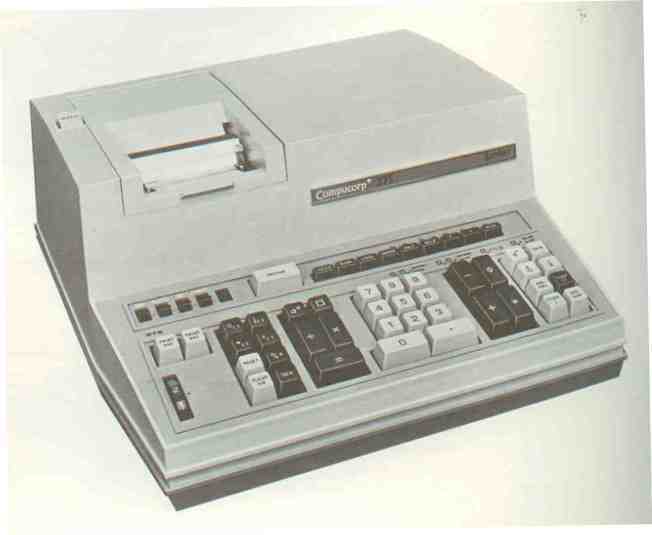 Sales had begun a slow decline through the early '70's, and by the mid-1970's, the losses incurred from the direct sales efforts forced Compucorp to exit the direct sales of its line of calculators, returning to selling its machines through OEM customers such as Monroe, Deitzgen, and others. In 1975, after producing nearly 300,000 calculators (including those made for OEM customers), the Compcorp Division of Computer Design Corp. filed for Chapter 11 reorganization as a result of Security Pacific National Bank declaring a loan to Compucorp in default. The terms of Compucorp's loan were that the bank would assume all assets of the company in the event of default. During the time that the bank assumption of Compucorp's assets occurred, the company's business strategy was changing yet again, with the advent of Compucorp's word processing systems. The word processing market was ripe for picking, however, with the finacial troubles, it became impossible for the company to further develop this avenue of business. By October, 1976, Computer Design Corp. was in deep financial trouble. On October 22, 1976, the company announced that it was shutting down operations, laying off employees, and seeking bankruptcy protection from creditors. Shortly thereafter, a group of employees, outside investors, and European OEM customers that saw the opportunities that small business computing and word processing could provide, got together and purchased the assets of Computer Design Corp. from Security Pacific Bank, and resumed business under the Compucorp name. The reconstituted Compucorp continued to make calculators for sale by OEM customers, along with developing new products directed at word processing. A hardware platform based on the new Zilog Z-80 microprocessor was developed, along with an advanced software environment called Omega. Omega included a very early networking technology that allowed workstations to share data over the network. The Omega system was marketed successfully in the late '70's and early '80's. It was sold under the Compucorp label, as well as via an OEM relationship with Exxon Data Systems under the Vydec brand. In 1981, after a failed acquisition of Compucorp by Philips Data Systems, a financier named Bernard Katz acquired majority financial control of Compucorp. To control costs, the engineering employees of Compucorp were encouraged to form a separate engineering company. Concurrently, Philips Data Systems wanted to contract a networking technology development for its products. Compucorp's engineering management formed a new company called Retix, to leverage the networking technology know-how gained through the development of Omega. Philips provided funding to Retix for the development of networking interfaces for Philips' products, as well as development of software that implemented an ISO-compliant network stack. The network stack became a product that was successfully marketed by Retix to a wide range of customers in the US, Europe, and Japan. With Compucorp's engineering talent either leaving, or moving on with Retix, no further development effort in Compucorp's calculator technology was made. By 1984, with the advent of IBM's "PC", and the market for calculators reduced to a "short-list" of players such as Sharp, Casio, Canon, TI, and Hewlett Packard, the market for Compucorp's products was no longer viable, and Compucorp ceased operations. There are many names of companies that participated in the calculator boom, and suffered in the later 'bust' of the calculator market...names like Bowmar, MITS, Cintra, Wang, Tektronix, Sony, and many more. Not all of these were complete victims, but certainly their forays into the calculator marketplace were folded up during the calculator wars of the mid-1970's. To this author, Compucorp was one of the more tragic losses of those times. Compucorp designers were truly ahead of their time, designing essentially the precursor to the microprocessor with their calculator 'core' chipsets at a time when the notion of a microprocessor simply didn't exist. Unfortunately, market pressures and the rapid rate of change in calculator technology forced many technologically advanced players out of the market. Sadly, Compucorp ended up being a victim of the times.